Lower eyelid “bags” and “dark circles” are two of the most common reasons patients see me for a cosmetic surgical consultation. Each patient will have a different story and presentation, although most patients have the same common complaint, “over the past few years I’ve noticed these dark circles and bags, which I didn’t have before, and they make me look and feel tired”. Another common complaint is that “I’m tired of people telling me I look tired”. As you will see in this section, there are multiple reasons for the development of dark circles and lower eyelid bags. Any rejuvenation plan needs to consider all the variables and design an individualized plan for each patient. Unfortunately most plastic surgeons who perform a few breast augmentations and a few eyelid surgeries a month know of only one or at most two techniques to perform surgery, and they use that on every patient that presents to their office for a consultation. The problem with this “cookie cutter” approach is that if you use the same technique on everyone, someone will have a problem. As you will see, not everyone will need surgery, and not everyone can be helped with non-invasive means of treatment. In our practice there are more than 30 ways to rejuvenate the lower eyelids alone, and the best treatment for you will be different than your best friends or neighbors. If you would like to schedule a consultation, contact our office and we will make sure to find a treatment to meet your specific and unique needs. What are the different variables associated with lower eyelids and aging? Why do I have lower eyelid bags? Are there creams that can help with the dark circles? I’m young and I don’t think I am ready for surgery. Is there anything less invasive? What are the surgical options for lower eyelid surgery? How long does the lower eyelid surgery take? What is recovery like for lower eyelid surgery? 1. What are the different variables associated with lower eyelids and aging? Genetics: The blue print of life is handed down from our parents. Thus it is very common that most patients will say that “I have my dad’s, mom’s, or some other relative’s eyes”. Although we don’t have any choice in this matter, it is an important part of our initial consult with you. Anatomical differences: Variations in our anatomy such as the position of the upper and lower eyelids, angle of the corner of the eyes, position of the brow, cheek and forehead, and prominence of the eyes are very important things to consider. For example some people have very prominent eyes (negative vector), and will need a different treatment than someone who has deep set eyes (positive vector). The aging process will be significantly different depending on the anatomical differences between each individual. During your initial consultation as part of the exam these specific differences will be noted to create an individualized plan for you. Skin changes: As part of the aging process our skin atrophies (becomes thin) and loses its strength. Also, because of frequent eye rubbing, the skin stretches and thus we develop excess skin on both the upper and lower eyelids. Loss of volume: As part of the aging process we continue to lose volume in the face. In some people this is a major part of why they get “bags” underneath their eyes. During the initial evaluation we need to determine this important variable. Descent of the midface or cheeks: Because of the effects of gravity as we age, the tissue around the face drops. 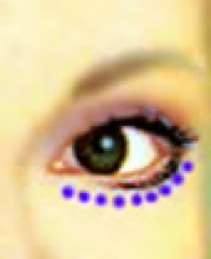 This contributes to making the “lower eyelid bags” even more prominent. Lack of sleep: The process of sleeping is not only important for our body and mind to rest but it is essential in getting rid of waste build up and in the rehydration of facial tissue. It is recommended that everyone sleeps at least 7 hours per night. Studies have shown that diuretics such as coffee and alcohol, combined with lack of sleep, will lead to significant accelerated aging. Sun exposure: It is never too late to start using good sun screen. Sun exposure not only can lead to skin cancer but it can significantly accelerate the aging process. We recommend SPF of 25 + for everyone every day. You also want to make sure the product you use has both UV-A and UV-B protection. Diet: “Green vegetables can essentially cure everything”. This is true in a sense that green vegetables have tons of antioxidants and other nutrients which slow down the process of aging. A balanced diet is essential. There are a multiple reasons people get dark circles underneath their eyes, including genetics, lower eyelid position, lower eyelid bags, allergens, sun exposure, previous trauma, and loss of volume in the cheeks. Identifying the underlying cause is the most important and effective way to treat them. During the initial consultation Dr. Parsa will identify the cause and will come up with the needed treatment. If a specific eye cream is needed he will recommend it for you. 4. I’m young and I don’t think I am ready for surgery. Is there anything less invasive? Yes, in fact about 50% of the patients that see us for eye rejuvenation will not need surgery and they will benefit from minimally invasive procedures such as volume restoration, Botox, lasers, peels and eye creams. 5. What are the surgical options for lower eyelid surgery? 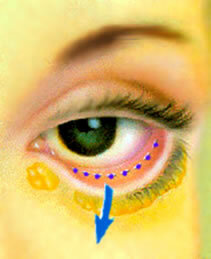 This involves making the incision behind the eyelid. This is the most ideal procedure for younger patients or those with very little redundant skin on the lower eyelid. The incision is then used to access the prolapsed orbital fat for repositioning or removal. If the patient has redundant skin, a pinch of skin could be removed, or the patient may need lasers or chemical peels to address this variable. The incision is made about 1 to 2 mm below the eyelashes on the lower eyelid. This procedure is best performed on older patients or those that may have significant redundant skin. This procedure can also be combined with a SOOF lift to achieve more harmonious cheeks and lower lids junction. 6. What other procedures can be combined with blepharoplasty? Because of their close proximity to the eyelids, the eyebrows and cheeks play an important role in the final aesthetic outcome of the procedure. During the initial evaluation, depending on your needs, a browlift or a mid-facelift procedure might be recommended in combination with the blepharoplasty. 7. How long does the lower eyelid surgery take? A typical primary eyelid surgery takes between one to two hours. No patient is every rushed to achieve the best results. 9. What is recovery like for lower eyelid surgery?